Daisy, a French Bulldog, loves to run around and play. But one summer her owner noticed her slowing down, panting heavily, and even laying down and refusing to keep going on walks. Concerned, Daisy’s mom took her to see a veterinarian. The vet evaluated Daisy and explained that she was suffering from Brachycephalic Syndrome, which is a common problem for dogs like Daisy. Other breeds that can be affected by this condition are Boston Terriers, English Bulldogs, Pugs, Shih Tzu’s, and Pekinese. What all these breeds have in common is the adorable “smashed” face look. Their unique faces are packed with personality and individuality, but in the veterinary world, this face-style is known as brachycephalic–meaning it is a “short-nosed” breed. 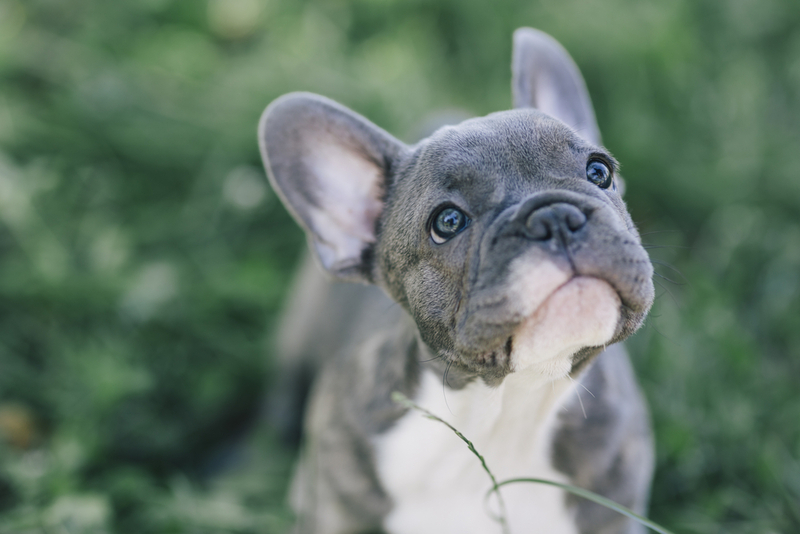 Brachycephalic dogs were bred to inherit this “smashed” or “flat” nose as a part of the conformation of their breed, but this breed trait also puts them at risk for Brachycephalic Syndrome. The most common problems associated specifically with brachycephalic breeds involve their airway and breathing. When the nose was shortened through breeding, the entire respiratory system was affected, and the animal’s soft palate will sometimes partially block their airway, affecting respiration. This is known as an elongated soft palate. Stenotic nares, another common problem with Brachycephalic Syndrome, is when the nostrils are too narrow. Dogs with Brachycephalic Syndrome will generally exhibit classic symptoms of their airway disease. Like Daisy, many animals will be exercise intolerant, becoming tired and breathing heavily (and noisily) after relatively short periods of activity. Some patients’ gums or tongue will turn blue during activity (called cyanosis) from lack of oxygen. Many pets affected with Brachycephalic Syndrome will sleep on their backs, to free up their airways and make it easier to breathe when sleeping. They will often snore, sound raspy or stressed when breathing normally, and will even gag or vomit, particularly when inhaling or eating. Luckily, these conditions can be improved with surgery for many affected dogs. Airway surgery and the post-operative recovery process can be delicate, so surgical repair with a board-certified surgeon and experienced support staff is very often recommended in these cases. While stenotic nares are typically readily visible from a routine physical exam, an airway exam under anesthesia is necessary to diagnose an elongated soft palate. Once diagnosed, the surgeon is able to trim the excess soft palate, and recovery is generally only a couple of weeks. Stenotic nares can be widened as well, and with a similar recovery period. This surgery allows the patient to bring more air in through the nose and allows easier breathing. It is important to resolve these problems early because airway disease can become much more severe with time. The increased effort to breathe can overload other structures as well, such as the larynx and trachea, leading to a dramatic worsening of your pet’s breathing problems. Also, studies have shown that opening up the airway with surgery can reduce the gastrointestinal signs in these patients as well. If you believe that your dog is affected by Brachycephalic Syndrome, even if their clinical symptoms are not significant, an evaluation by your family veterinarian or a consultation with a board-certified veterinary surgeon should be considered, especially during these hot summer months!